From books to Bull Terriers, via ukuleles, steam trains and a dipping pond: an eclectic set of personal passions were on public display last weekend on or around Shooters Hill. 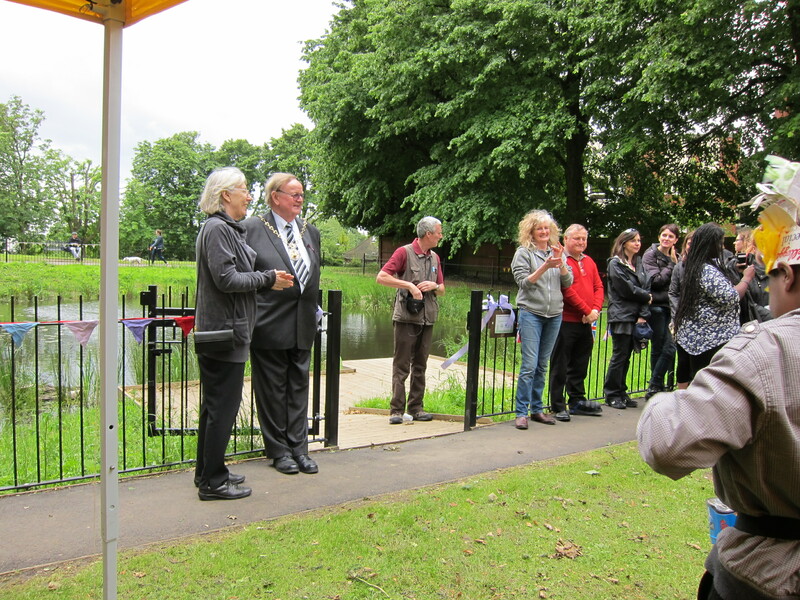 On Friday 15th June Friends of Eaglesfield Park wanted to share and celebrate with our local community that the once lost and forgotten pond has been restored into a wonderful wildlife pond with a dipping platform that hopefully will now become a focal point for visitors to the park. To Commemorate the opening The Mayor of the Royal Borough of Greenwich officially “cut the tape” and opened the gate to the dipping platform. We certainly won’t forget which year the restored pond was opened – 2012 (we became the Royal Borough of Greenwich, The London Olympics and The Royal Diamond Jubilee!). The day will also hold a further significance for several children who tried out our pond dipping platform. They received a unique certificate to commemorate they were part of the opening ceremony and among the first people (children or adult !) to use the pond dipping platform. Although our large marquees would have provided shelter, we were indeed lucky to have good (well reasonable) weather and our planned celebrations opened in true carnival spirit with the children of Plumcroft and Christ Church primary schools in vibrant costume and displaying their considerable drumming and dancing talents. We would like to thank TARU Arts, a local Woolwich based community Arts Project, for the great job they have done working with the local schools in the lead up to this event and in organising the festivities. Of course we would also very much like to thank the Staff and children from Plumcroft and Christ Church Schools for taking part with such enthusiasm. Throughout the day TARU provided drumming and hat making workshop opportunities and face painting for the children. Add to this a vibrant Brazilian Jazz Band and Zumba dancing and the aroma of delicious spicy food provided by Guarida Community Cafe, we indeed enjoyed a festive celebration. Who needs sunshine anyway! The wildlife pond area looks wonderful and we would like to say thank you to the “diggers and gardeners” for their time and enthusiasm (and tools!) for helping to create the wildlife meadow surrounding the pond. The pond is already attracting tadpoles, small frogs, water skaters, leech, newts and, as yet, unidentified “bugs” and visits from two mallard ducks. The wildlife flower seeds have been sown, but it is next year that we can expect a colourful display. Following the enthusiastic drumming and dancing on Friday, a different enthusiasm was on display early on Saturday morning in the bibliophilic queue at the Church of the Ascension in Blackheath for the Amnesty Blackheath & Greenwich Book Sale. The technique adopted by the most sadly enthusiastic is to grab an old cardboard box and quickly fill it with as many books from your favourite sections as you can and then to sit at the altar end and sort through them to decide what you really want. My more modest selection included Jon Snow’s “Shooting History”, which I was really pleased to discover later at home had been autographed by the author. I’m looking forward to seeing Jon in conversation with some of the Elders at the Barbican next week. Later at the Eaglesfield Park Neighbourhood Watch 2012 Annual Community Fete there were opportunities to join in a very wide range of local enthusiasms, such as sporting (Shooters Hill Lawn Tennis Club, Shooters Hill Golf Club, Woolwich and Plumstead Bowling Club), Conservation (Woodlands Farm, Shrewsbury and Eaglesfield Park Friends‘ Groups, pond dipping) and historical (Shooters Hill Local History Group, Severndroog Castle Preservation Society) together with a strong contingent from the Metropolitan Police. Entertainment was provided by The Fleas Ukulele band. Unfortunately I had to leave when the bagpiper started. A gentle walk across Oxleas Meadows and through Shepardleas Wood took me to Eltham Park South, where the Doggie Fun Day was in full swing. The highlight was the Bull Terriers Diamond Jubilee fancy dress parade and competition. I felt slightly sorry for the indignity suffered by the dogs in their imaginative costumes …. such as a jousting horse, lots of England football fans and a Sherlock Holmes complete with waxed jacket and deerstalker hat. Sherlock suffered added indignity when the compere announced that he had come as a tramp. 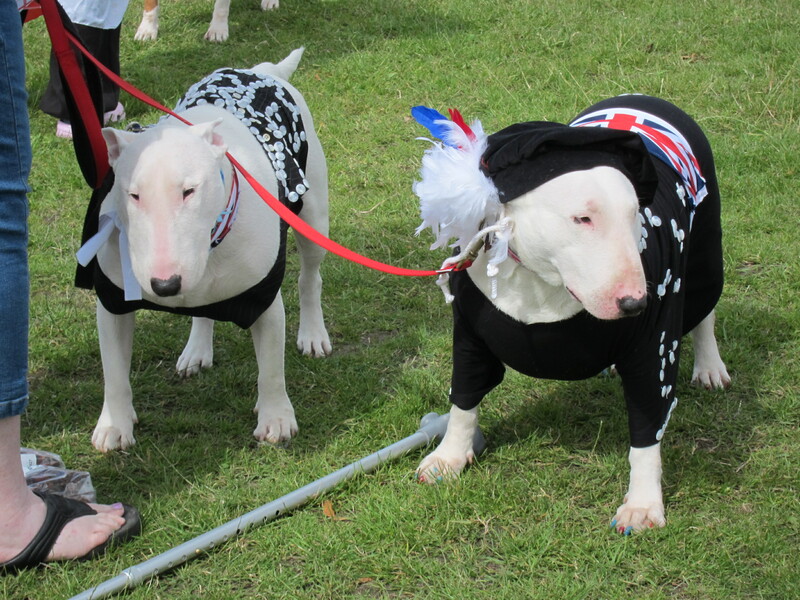 The well-deserved winners of the competition, and the Jane McInnes Trophy cup, were a pair of English Bull Terriers dressed up as pearly king and queen. There was a special commendation for a bull terrier who entered as a very convincing chihuahua (in fact I think it was an actual chihuahua pretending to be a bull terrier pretending to be a chihuahua). 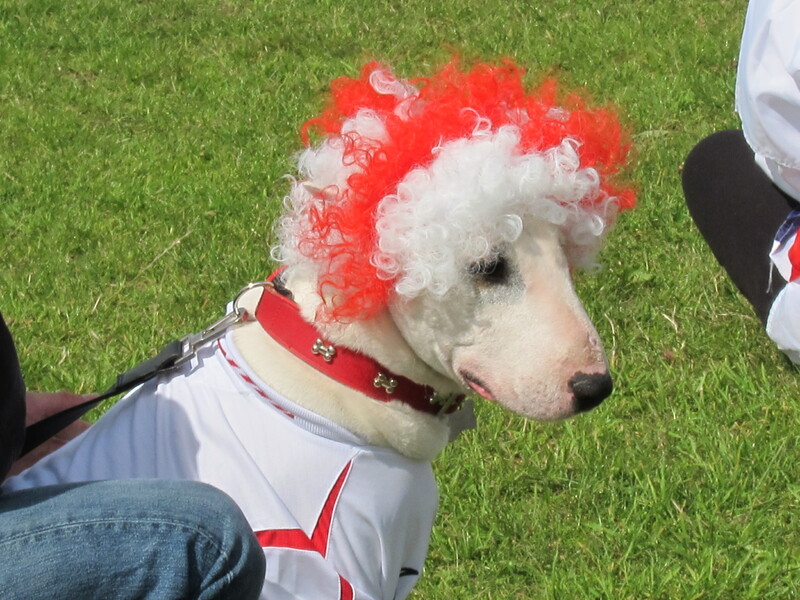 The competition included Bull Terriers rescued by Absolute Bull Terrier Rescue. 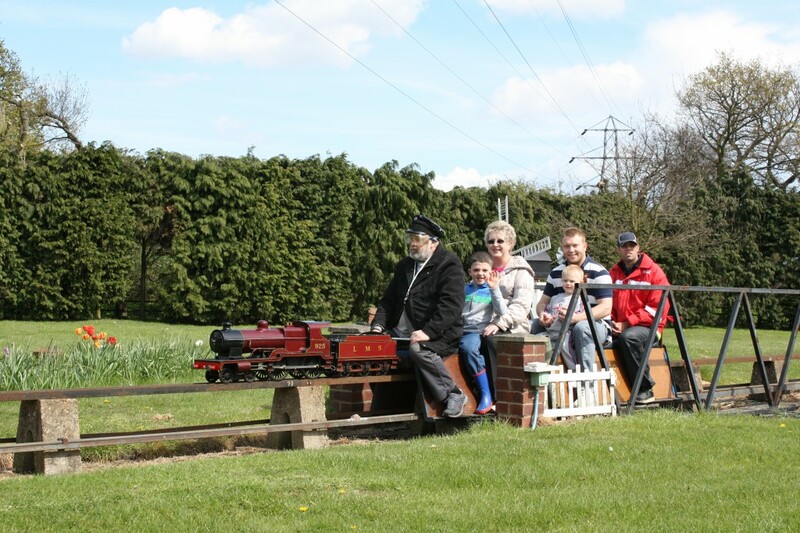 Finally, Sunday was one of Welling and District Model Engineering Society’s public running dates. The WDMES is a group of enthusiasts for model steam trains, many of them former engineers who build the model trains themselves, fabricating the precision-engineered components necessary for the steam engines. On the public running day engines of varying sizes are put through their paces, but the main attraction is to ride on one of the trains on the 1268 feet 3.5″ and 5″ gauge raised steel track. What a very varied set of enthusiasms and enthusiasts! There are more photographs on the e-Shootershill Flickr site.